In April of 2013 this Sustainable Work blog will be 8 years old. I've wanted to do many kinds of jobs since I was a kid. Throughout it all I've wanted to write and work as an entrepreneur. My first small business gig was through the Elmhurst (IL) Press Agency. I think I did this from about 6th to 8th grade A group of us would come tearing into this newspaper office on our (un-lit, un-helmeted, look-no-handlebars) bicycles at about 4:00 AM in dead darkness during summer breaks. We bought papers (Chicago Tribune and Sun Times) from the agency for $0.08 each for the right to sell them for $0.10 each. Plus tips. That's where you made your money. The agency would shuttle us out to the busiest corners in the region in a rickety old van. My spot was the corner of (IL) Route 83 and North Avenue. My job was to run as fast as I could between long lines of cars that would stack up at the red lights. Customers would stick their arms out of their drivers window and you'd run to sell them their paper. Then I'd look up for an arm waving in the exhaust fumes further down the queue and I'd take off running to get to them before the light changed. By hindsight this was nutty, considering the moving traffic, early 1960's engine emissions, and a million other small, grave dangers. I think good entrepreneurs and writers love the same stuff, They look for opportunities to run through dangerous traffic. I really like practicing the writing part here. My blog numbers have risen steadily since 2005, but this last year has seen a real bump in visitors. Lately this blog has registered more than 9,000 page views per month, and more that 86,000 total page views since it's beginning. These are not crazy viral numbers, but they certainly make me want to keep running and writing. Thanks to everyone who visits this site. It's time to start or grow your own new enterprise. Get out there and play in the traffic. I wish you a wonderful 2013! 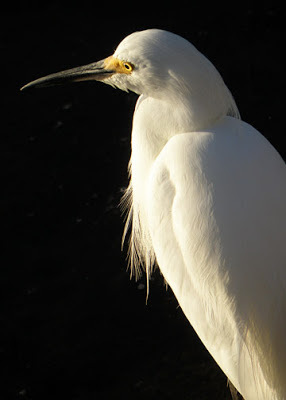 Photo: Snowy Egret I spent some quality time with at the Ding Darling National Wildlife Refuge, December 2012.